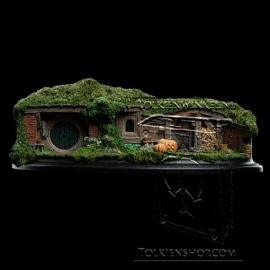 Polystone representation of Bilbo's and Frodo's house in The Shire. 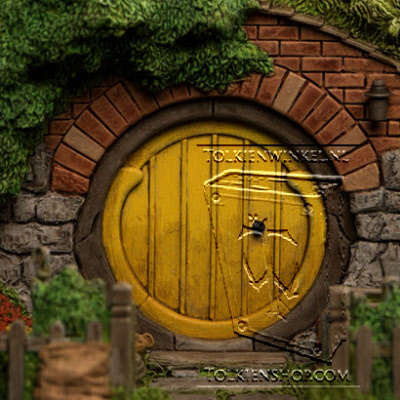 The front door is also ajar to show the paved floor of the entrance hall of Bilbo's abode. 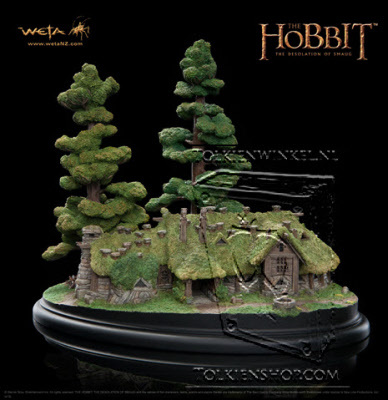 It has had the nod of approval by Dan Hennah, John Howe and Alan Lee who were jointly responsible for the Bag End set. 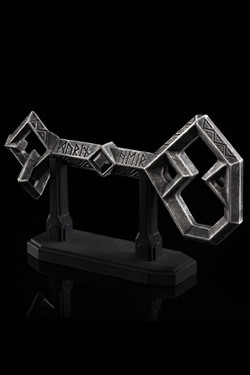 Not a numbered, limited edition, but no longer in production. 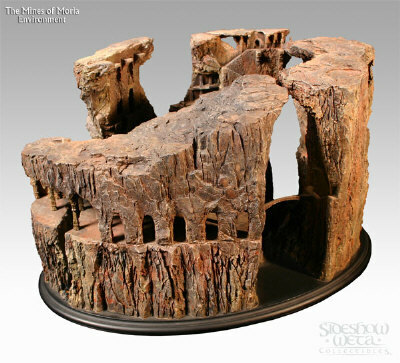 Dimensions: 5.9" x 11.8" x 7.1" (H x W x D). At the lip of a waterfall with breathtaking views over the hidden valley to the east stands an airy dome of carved stone. A roof of delicately interlaced stone tracery perches atop twenty-four elegant carved pillars, each gently entwined by snaking vines. 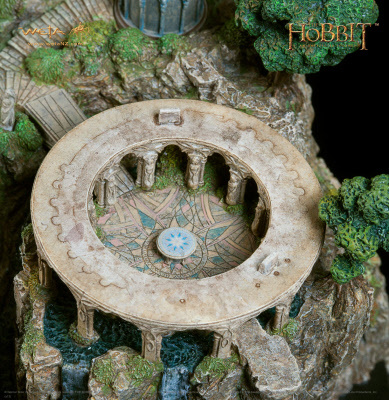 In the centre sat a broad, flat table around which Rivendell’s Lord Elrond played host to members of the White Council. 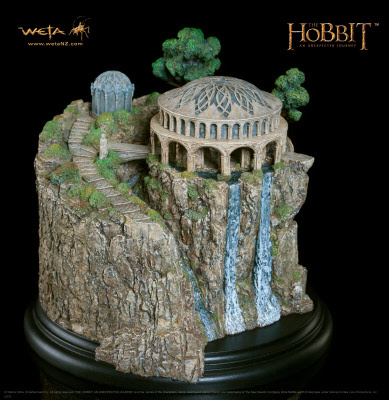 In this chamber, with the roar of the waterfall underlining the gravity of their discourse and the stars overhead, a gathering of wise Elf Lords and members of the Order of Wizards convenes to debate whisper of the return of their ancient enemy. 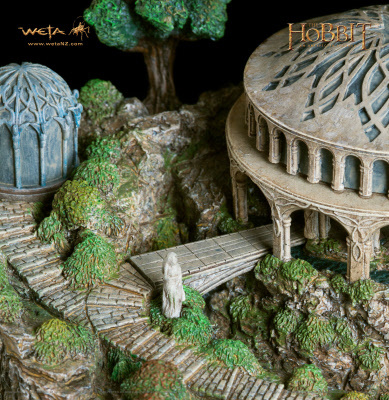 Saruman the White, leader of the council and greatest of the Istari, casts doubt upon the signs and evidence brought before them by his fellow Wizard, Gandalf the Grey, but standing with Gandalf at the break of dawn, the Lady Galadriel of Lórien reassures her long time friend of the esteem and trust with which she regards him. Beneath the pale stone arch and as the first light of day sets her hair ablaze with shining gold, she promises to be at his side when needed most. 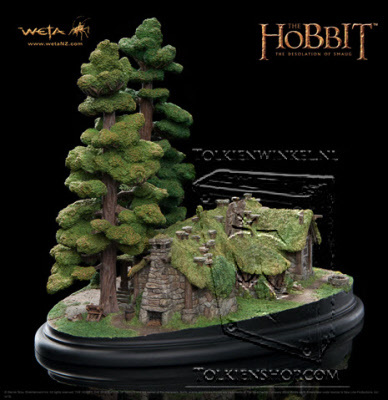 Weta is very proud to announce the first collectible environment from The Hobbit: An Unexpected Journey. 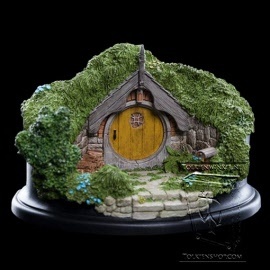 Weta's legacy of finely crafted minitures from Middle-earth continues with this iconic piece from the first movie. 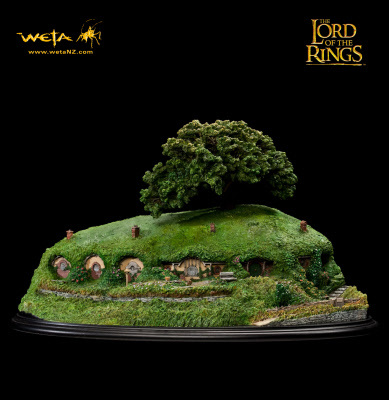 The White Council Chamber environment from Weta is based on the set featured in The Hobbit: An Unexpected Journey and built by a team of the same artists and craftsmen that work on our movies, led by Senior Modelmaker David Tremont and Leonard Ellis. The piece features a removable domed roof that allows a peek into Elrond's chamber. 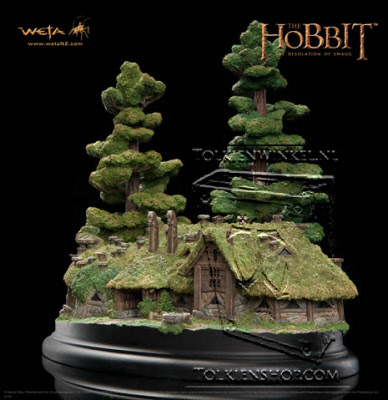 Weta 1631. 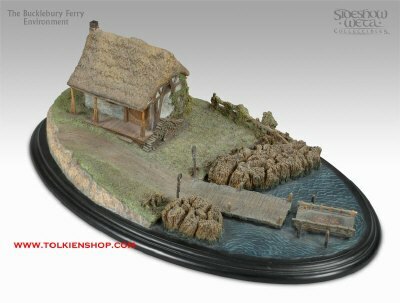 This is the last in a series of three Sets, which together make up the entire Fellowship of the Ring. 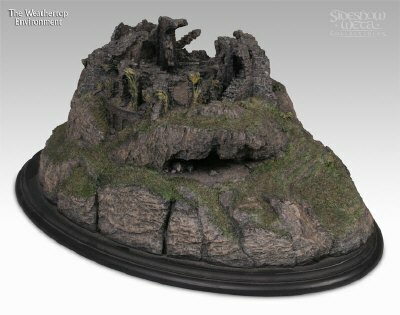 These three Sets have been created in response to ongoing collector requests for a diorama of the full Fellowship on their trek across Middle-earth. 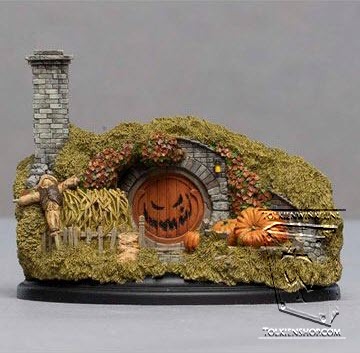 They have been sculpted at miniature scale (for those with limited shelf space) and are ideally suited to display alongside our iconic The Lord of the Rings environments like Rivendell and Bag End. 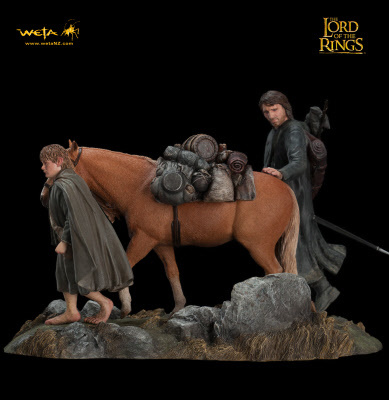 The height from the bottom of the base to the top of Boromir´s blonde locks is 5.1 inches (or 13 cm). 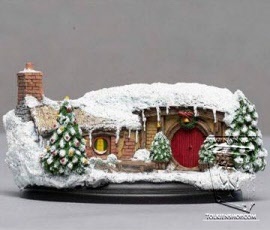 The base is 7.9 inches (or 20 cm) long and 5.1 inches (or 13 cm) wide. 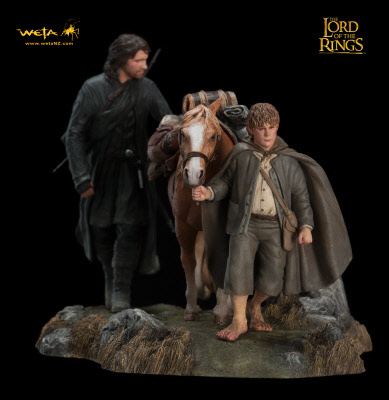 The hobbits are just 3 inches (7.5 cm) tall from head to toe and Gimli only slightly taller at 3.5 inches (9 cm). 1 Bagshot Row was sculpted by David Tremont and Leonard Ellis. Size: 2.4x4.7x2.2"/6x12x5.5 cm. 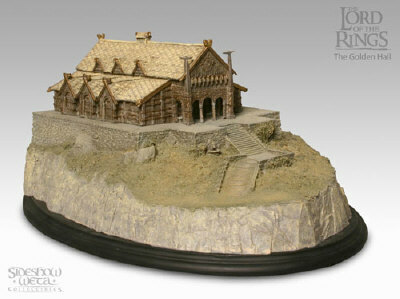 We will be creating more of these miniature environments from Hobbiton in this series in the months to come. 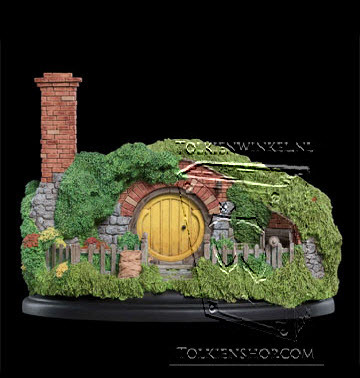 Turning right out of his front gate would lead Mister Bilbo BagginsTM past the entrance of number 36 Bagshot Row, the pretty, blue-doored home of one of Hobbiton’s most enthusiastic flower gardeners, with its front yard full of pots of colourful blooms. 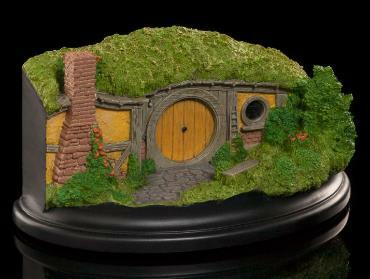 Just where you enter Hobbiton from the south, the road bends and enters a cutting through the grassy hills surrounding the village. 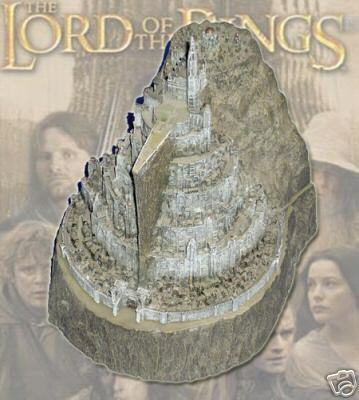 It´s known locally as Gandalf´s Cutting after the Grey Wizard who often enters from that direction. Just there, on the left is a smial with a blue door adorned with a beautiful leadlight porthole and a small halfmoon window, often dressed with drapes to match. 35 Bagshot Row was sculpted by David Tremont and Leonard Ellis. 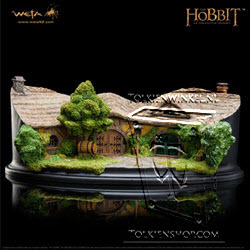 Weta 2512, 2019. 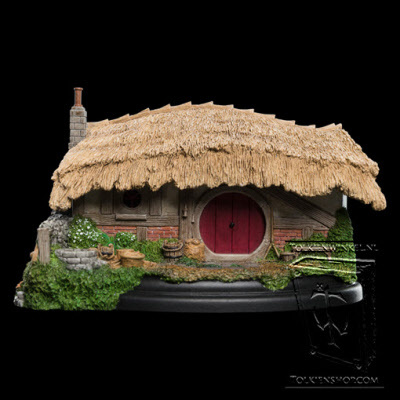 Scattered among the grassy hills of Hobbiton like a purse full of lost coins, the bright round doors of many dozen hobbit-holes shine in bright, summery hues, each home to a Hobbit or family of the little people. 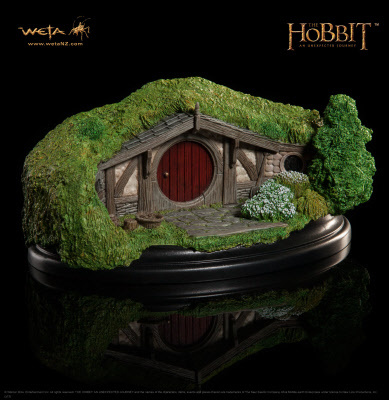 As diverse as the rosy-cheeked hobbits themselves, every smial, as hobbit-holes are known, reflects the unique personality of its inhabitant and nestles into the hillside amid a sea of lush greenery. While Bag End boasts many rooms, most hobbit homes are less sprawling. Halfway down the Hill from Bilbo's grand dwelling. 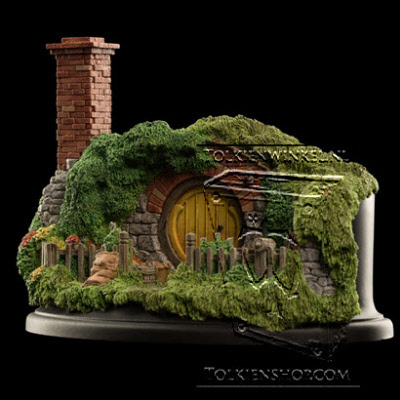 Hill Lane addresses, like Number 5, are among the smallest smials in Hobbiton, though no less colorful. 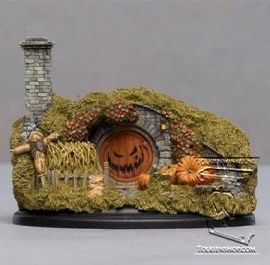 5 Hill Lane is an Open Edition piece. 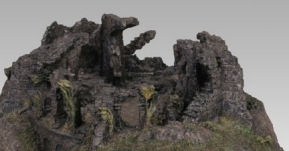 Please note: images are of a pre-production prototype. Each piece is painted by hand and slight variations will occur. 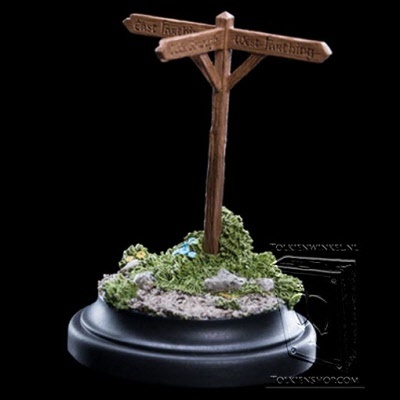 Includes seperate signpost. 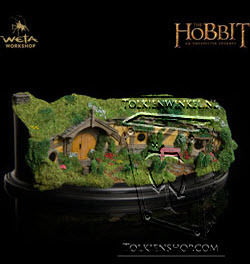 Weta 2620. 2018. Scattered among the grassy hills of Hobbiton like a purse full of lost coins, the bright round doors of many dozen Hobbit-holes shine in bright, summery hues, each home to a Hobbit or family of the little people. Winding along the Water's edge the Lakeside path was home to fishermen, net-makers and other hobbits living upon the banks of Hobbiton's lake. Where the snaking road cut back inland and began to climb the Hill was nestled the only dwelling in the village without an iconic round front door. Number 34's arched doorway was painted a rusty red, with views back towards the end of Bagshot Row and the swampy fens. 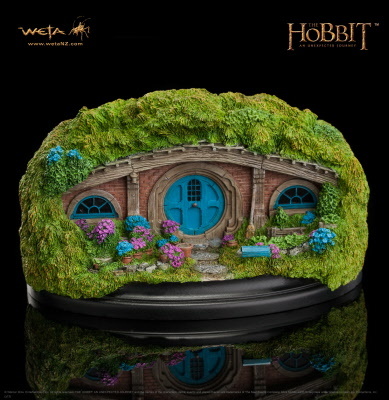 Each an individual dwelling, the Hobbit holes lend themselves splendidly to creative placement in your cabinet. With a flat back and shallow depth of only 55 mm, they can be placed on mantles, cornices, shelves and in windows. Scattered among the grassy hills of Hobbiton like a purse full of lost coins, the bright round doors of many dozen hobbit-holes shine in bright, summery hues, each home to a hobbit or family of the little people. 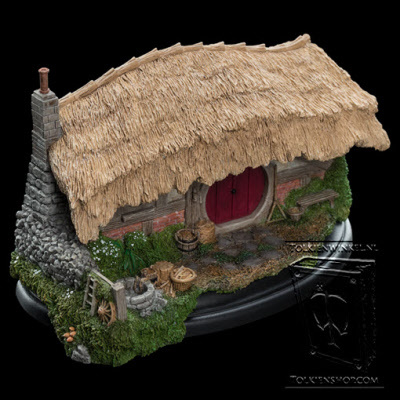 Down the hill and across the water lies the favourite watering hole of every Hobbiton inhabitant, the Green Dragon, an establishment of impeccable repute where cool ale and warm conversation wash away a days tests and toils. Any night of the week a chorus of laughter and cheer rises with wood smoke from around the Dragons glowing hearths, rosy-cheeked, full-bellied patrons singing a lazily sinking sun to sleep. 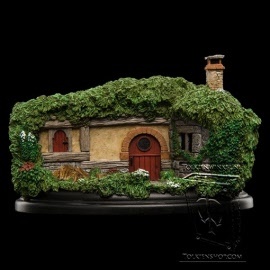 The Green Dragon Inn was sculpted by David Tremont and Leonard Ellis.